This post may contain affiliate links. Thanks for supporting my blog! It’s been way too long since I’ve blogged and I am excited to get back in the saddle! Anyway, I wanted to tell you guys about how I’m Marie Kondo-ing my house, but in an adaptive way that accounts for the fact that I homeschool, have a part time job, have outside chores to take care of, have a rather needy autistic son, and have to *occasionally* (ha, ha!) feed my family and make sure they have clean clothes! So, a little back story first so you know where I was and where I am now! 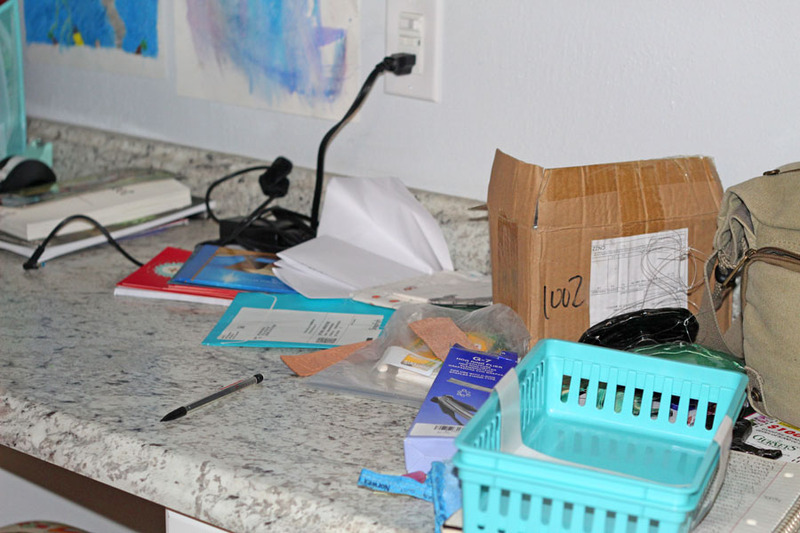 Many moons ago, I was a very messy mom- and not necessarily in a fun, let’s-be-creative messy way. My house was just downright cluttered. When I look at old pictures, the background is embarrassing. And, let’s face it- “stuff” is inevitable! So, about 7 years ago, I set out to change things, but I had no direction. I just knew I needed to get a handle on our possessions! I did what I could and due to several house relocations over a two year period, I was able to make a dent, but I didn’t feel like I was where I wanted to be. Cue the advent of Marie Kondo! Too often, though, my homesteading mentality of “But I might need this some day!” would get in the way of my decluttering and I would completely stall out. Anyway, after I read her book, I started looking at my possessions in a whole new light! But, here it is 4 years later, and, while my house hasn’t gone backwards, per se, it’s definitely time to take another look at our stuff. It just seems that clutter creeps in bit by bit until you open a cabinet and notice that it’s packed to the gills! When I saw that Marie Kondo had a Netflix show, I knew it would be the inspiration I would need in this new year to weed out the clutter before it gets any worse. If you have ever watched her show (or read her book, which I would highly recommend! ), you know that she advocates decluttering in categories and piling everything in a category into one place so you can visually see how much you really own. 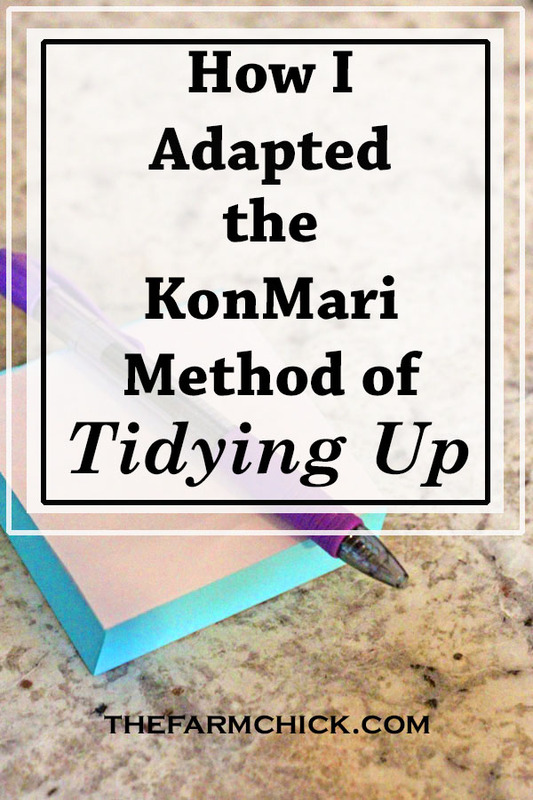 While I definitely see the value in this approach (especially if you are new to the decluttering gig), I also know that I don’t have the necessary time and space to go about it that way. So, I have come up with a hybrid approach I wanted to share with you that I find works very well for this busy mom/homesteader/gardener/homeschooler! First, I decide which area or room is driving me the most nuts at that time and that’s where I start. Then, I divide it up into small sections (a cabinet or set of drawers, etc.) and apply the Marie Kondo method. For instance- the kitchen was really bugging me after all the holiday baking and cooking, so I tackled it first. But, instead of emptying out my cabinets and drawers all at once and effectively rendering the kitchen useless (which is not an option around here! ), I just hit one section of cabinets at a time. I took everything out of that one cabinet, wiped it out, then only put back what brought me joy. Now, I’ll be honest, my kitchen was already very well organized (I spend hours in there every day so I know how I like it! ), so it wasn’t as overwhelming as it may be for some, but there were still things in there that for whatever reason, no longer brought me joy. So, out they went. I’m currently tackling my office area. I don’t have time to completely empty out all 4 cabinets and both drawers, because it’s the ending of our farm’s fiscal year and the beginning of the new one, so I need my office usable. Because I spend more time there this time of year, though, it was really bothering me, so that’s how it got put on my list. This is everything that doesn’t spark joy that was on the bottom shelf of the cabinet! 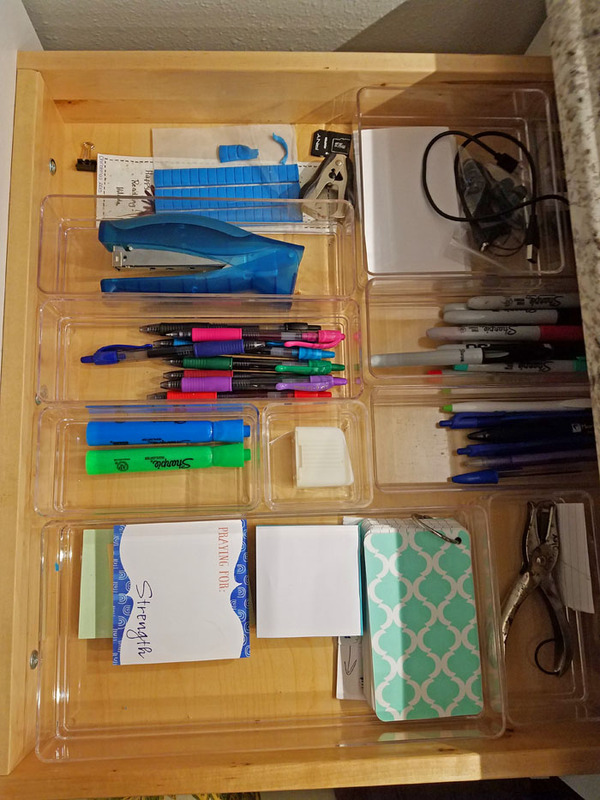 On Saturday, I emptied one drawer (the one with all my pens, stapler, password book, odds and ends, etc) and only put back what brought me joy. Yesterday, I started on one cabinet. I took everything out, wiped it down, and only put back what brought me joy. Tackle one small area or cabinet, take everything out, and only put back what sparks joy. Isn’t this drawer so pretty?? It definitely brings me joy every time I open it! 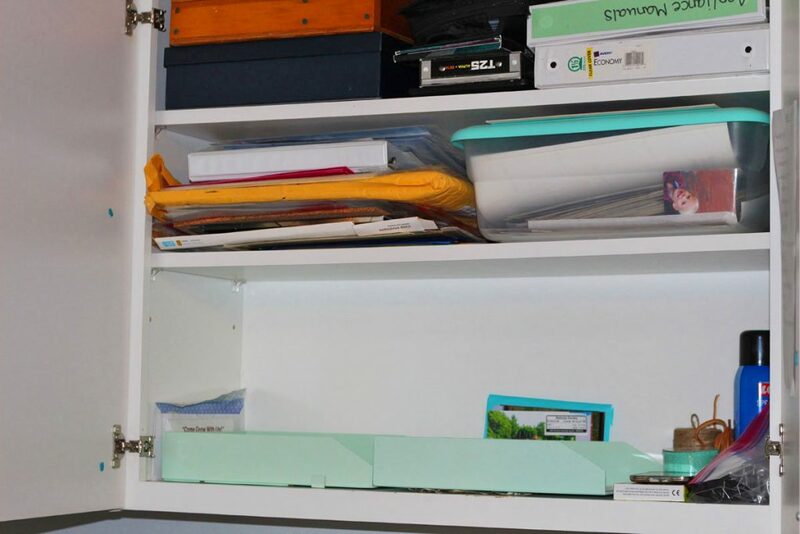 And, in case you’re wondering, you can get my drawer dividers here. Now, as you go through your house, you may decide to rearrange how you have something after you’ve already gone through it, but there’s nothing wrong with that! So, tell me- have you jumped on the Marie Kondo train yet? Any other tips for decluttering your house and keeping it tidy?